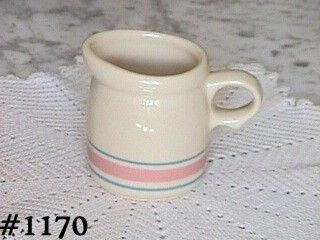 This listing has a beautiful little creamer from McCoy's Stonecraft dinnerware line! Creamer is in the pretty creamy color with pink and blue stripes/bands. It is marked on bottom: 1414, USA. Creamer has no evidence of "use". It has two production non-glaze spots -- these are typical McFlaws and are of absolutely no consequence to appearance or use, really not worth mentioning! This is an excellent piece of McCoy Pottery that is both pretty and useful!